I haven't posted in a while, but for good reason. 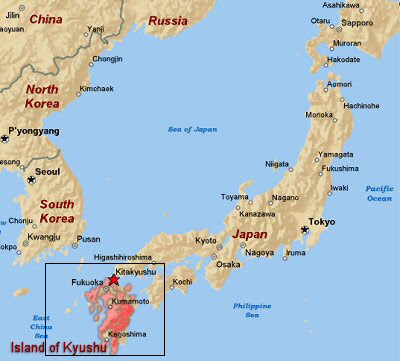 For the past 11 days Michelle and I have been on a crazy road trip adventure across Kyushu, the southern most of the four main islands of Japan. Overall the trip was a great success - we had an absolute fantastic time together. One of the things that made the trip so much fun was that we had no set plan. We picked up a road map at a convienance store on the way out, and for a majority of the trip we only had the next day planned. Most of the hostel reservations we made the day of, and in one instance actually showed up in a town at 5:00pm and spent an hour trying to find somewhere to stay that night. We took advantage of the flexibility, and constantly changed our plans on the fly. If we liked one location a lot, we stayed an extra day. If a place wasn't that good, we immediately packed up shop and headed out. Some of the highlights of the trip were Mt. Aso, an active volcano near the center of Kyushu, Kurokawa, a beautiful onsen town and Yakushima (known as "Asia's Galapagos"), home to the most beautiful nature we have ever seen. We ate a ton of different foods and local delicacies, including three different kinds of ramen (Hakata style, Kumamoto style and Kagoshima style), raw horse meat (a delicacy in Kumamoto - I only ate a little and I felt horrible at eating that...), and Kagoshima bar-b-que. In Miyazaki Prefecture, we even dined on Mexican food and attended a Japan pro league basketball game! For a majority of the trip we drove everywhere using small, one lane back roads. This was mainly to avoid the expensive tolls that the highways charge, but also to see and experience many of the small and sleepy rural villages that dot Kyushu's landscape. Prior to leaving my co-workers were a little concerned that we were taking our tiny "K-Car" (economy sized vehicle) the entire way, but our car served admirably. In total we drove a whopping 2,100 kilometers (roughly 1,300 miles), which from San Antonio would have gotten us all the way to Chicago! While it feels nice to be back home in Oshima, we really had a great time in Kyushu, and had a ton of crazy, fun and weird Japan experiences along the way. I will definitely highlight some of the more interesting ones in future posts!